Photographing a hummingbird moth at last light, with no time to experiment with camera settings, isn’t easy. On that evening, there wasn’t any photo worth saving. On the other hand, adult moths, which usually fly at night from dusk until dawn, sometimes can be found during the day, seeking nourishment from plants like larkspur, petunia, honeysuckle, thistle, and columbine. Plumper than hummingbirds, they’re relatively easy to spot in daylight, and easier to photograph. A year later, when I found this second moth hovering in a patch of wild columbines, I was better — if not perfectly — prepared. 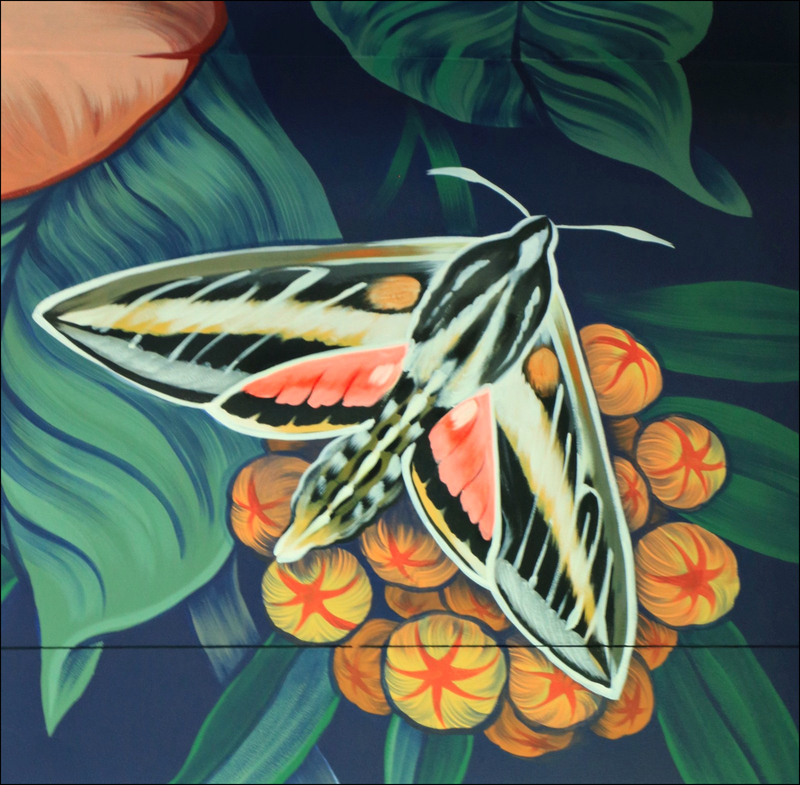 Last June, I discovered a third hummingbird moth hovering over some tropical milkweed buds in a mural installed for Crystal Bridges Museum of American Art’s exhibition, The Beyond: Georgia O’Keeffe and Contemporary Art. Painted on a wall, that moth wasn’t at all difficult to photograph. 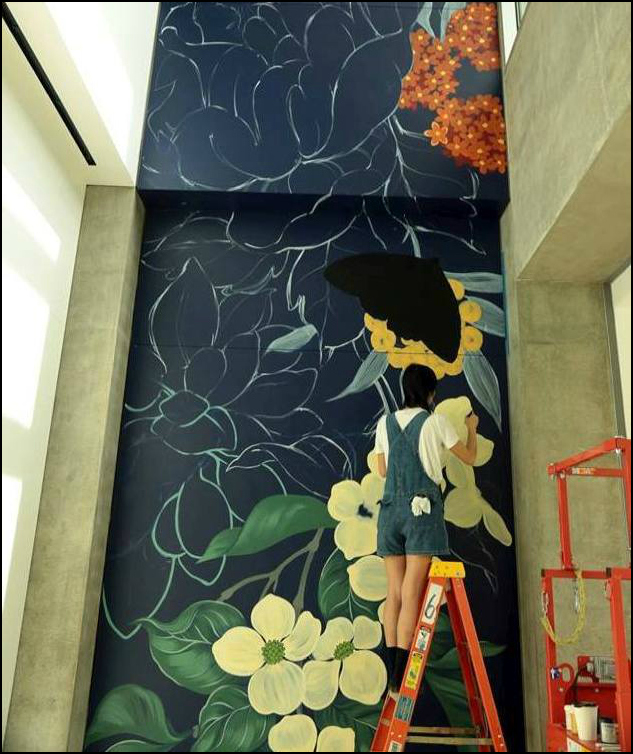 The work of Detroit-based artist Louise Chen Jones, known professionally as Ouizi, Picked from the Garden of Celestial Delights filled the corridor outside the exhibition. I think it’s just fun to paint from memory. I’ve studied and borrowed shapes from different flowers. They become imaginings of different species, but I also love to incorporate real flowers, depending on the project. For her work at Crystal Bridges, Jones looked to site-specific plants for inspiration, meeting with Crystal Bridges horticulturalist Cody George to learn about plants native to northwest Arkansas. 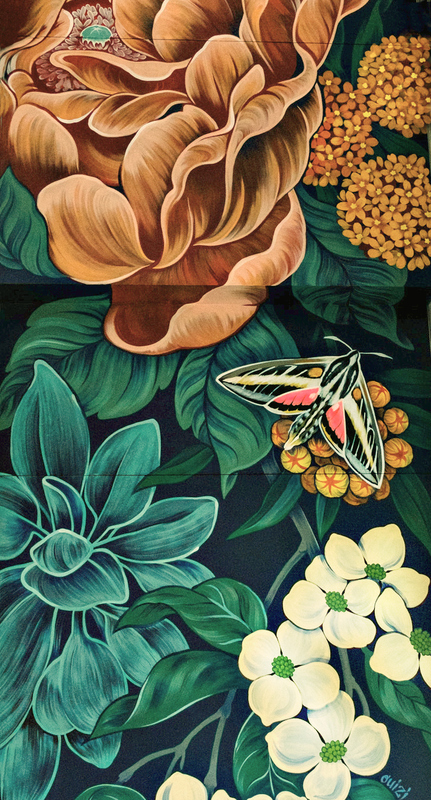 The inclusion of butterfly milkweed, dogwoods, and a white-lined Sphinx moth in the mural was a natural result. For large-scale installations such as that at Crystal Bridges, Jones uses bucket paint, and the occasional pizza pan as a palette. Still, success has provided her with new options. 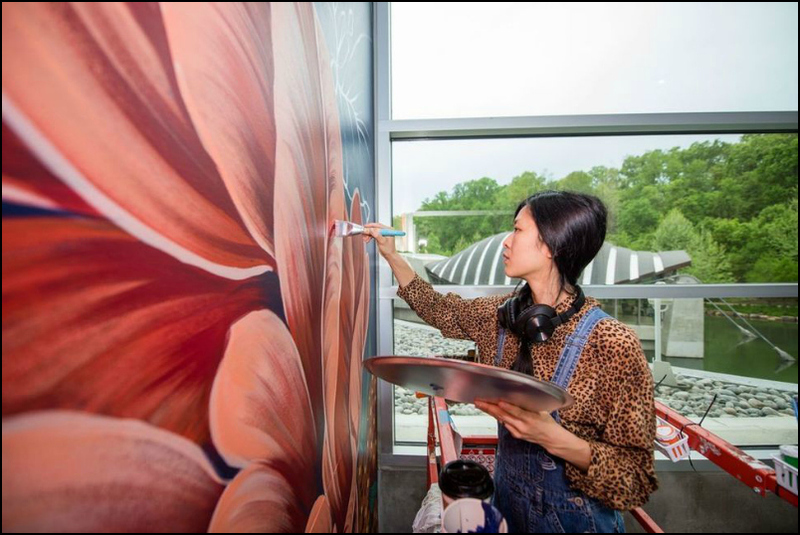 “I started out making murals with loose, leftover bucket paint, and mistint paints from Home Depot — I had to learn to match colors with whatever I had. Having worked as an illustrator and fabricator in Los Angeles, Jones began creating murals after moving to Detroit in 2013; her work there has become so popular that commissions have come from across the United States and from around the world. She considers herself as much an artisan as an artist. Although she studied drawing and printmaking at the University of California, Santa Cruz, she also depends on skills learned outside of school, such as metal fabrication, woodworking, sewing, and painting. Approximately how many pieces of art do you typically create in a year? I make something out of nothing every day, so at least 365 — but that depends on what you consider art! I make most of my money through large fabrication projects and commissions. The fabrication projects are usually for festivals and other corporate funded events, which involves construction or some other form of manual labor. I do not consider this to be directly my art practice, but it funds my ability to make art and has helped me acquire skills that I did not learn in art school… I also enjoy physical labor and hard work, and if I did not have to work for other people to make rent every month I would just be doing my own crazy construction projects. I have an excuse to be dirty, disheveled, and decorated all the time. Not only fine artists are interested in the hawk-moth. Scientists, too, find the creature fascinating, and sometimes approach it in quite artistic ways. Eleanor Lutz’s animated infographic on the hawkmoth is an example; here, she explains its background. When I worked in [the University of Washington’s Riffell lab] as an undergrad, I helped out with an experiment about mosquito larvae. As part of the process we used a Matlab program to manually input the larva’s location during thousands of video frames. It was a fun experiment, and I wanted to make something similar from YouTube videos. I found slow-motion videos of five flying species, and mapped out specific points on the wings during one wingbeat. I ended up with 15 frames per wingbeat, and I connected every frame using imaginary curves that went through all of the 15 mapped points. Of course, 15 frames isn’t nearly enough for any kind of factual conclusion, so this… is just an art exercise. But hopefully you can enjoy this as an artistic pattern based on real life. The most important thing for me to get across in my science illustrations is a feeling of delight or surprise. I want people to think science is awesome and really exciting, even if they don’t understand everything about the subject. 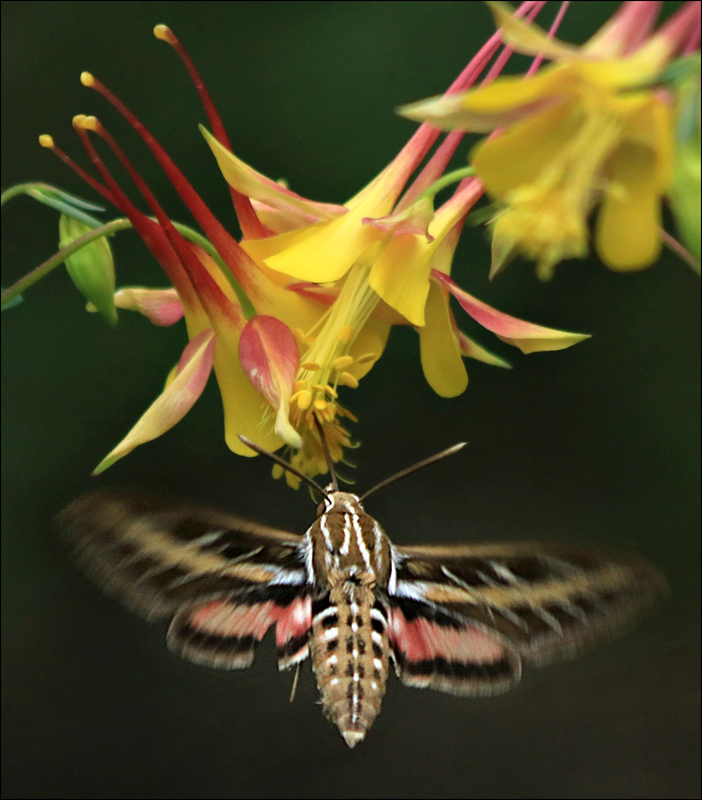 Members of the Sphingidae family, some of the largest flying insects in the world, hawk-moths can hover for minutes in front of a flower, extending their proboscis into its depths to feed while maintaining stability. To understand the hawk-moth’s responses, Professor Hedrick and his collaborators used a variety of high-tech methods, including 3D-printed “moth cannons” that shoot tiny copper cannonballs at the resilient insects while they sip nectar — all under the unblinking eyes of three high-speed video cameras that each shoot 1,000 frames per second. Hawkmoth wings flap 30-50 times per second, so Professor Hedrick and his team capture roughly 40 frames per hawkmoth wingflap with each camera. The resulting 3D-flight videos are analyzed to identify how the moths recover and stabilize their hovering flight after being bombarded by a cannonball . Beautiful and beautifully evolved for specialized flight, the hawk-moth is far more than a fleeting blur in our gardens and landscapes. Having seen it now through the lenses of both art and science, I suspect my next encounter with the creature will be even more delightful — however sharp or blurry my photos. Excellent, Linda. You offer so much information and in such a delightful way. Thanks. I’ve been intrigued by these little creatures since I saw that first one. I’ve been asked, “How long does it take you to write a post?” In this case, it took about two years to gather the bits of information — a necessary first step, as you know. Be careful which species you hope for. A friend in a northern state has been fighting the tomato hornworm, which just happens to be the caterpillar of the five-spotted hawkmoth (Manduca quinquemaculata). I’ve been told they’re voracious feeders that can nearly eliminate plants overnight. I’m sure you have different species, so you may not face the same kind of problems. Jones’s work is wonderful. I like her distinction between artistry and artisanship, and always feel a certain kinship with any woman who enjoys manual labor. I thought it was interesting that the moth was one of the last things to be painted into the mural. It makes sense: first the flowers, then the moth, just like in a real garden. Great job, Linda! I agree with John. Thanks, Pit. You no doubt have a few of these flitting around your place, too. Hummingbirds, yes. Hummingbird Moths? I don’t know. This is the first time that I’ve heard of these moths. Thanks for your post and for teaching me something new today. There’s always something new to learn. For me, that’s one of the greatest joys of blogging, and one of the best reasons to ignore the advice to write what we know. If I’d been writing only what I “know” for the past decade, I wouldn’t have learned nearly as much myself. You did a good job portraying the white-lined sphinx and columbines. Even though the moth may hover, getting a good photograph of it isn’t easy, as I can attest. When I first saw one of these about 15 years ago, I was understandably fascinated. Finding the columbines and the hawkmoth together made for a special treat, since this also was the first time I’d found the flowers. They certainly do make a good match, and I stayed with this one until it zipped away. I’ll be glad when I see another; I suspect my added knowledge may make one easier to follow. So much art and science in one post! Excellent! The first working title for the post was “Art, Science, and Nature,” which sounded too much like a pretty dry essay. Still, the best botanical artists employ the sciences, and the best scientists always have been artful in their explorations of nature. I thought looking at this little creature through both lenses would be a good approach — I’m glad you enjoyed it. They seem to be wide-ranging, and I’ve already come across others who see them on a regular basis. Now that I know which flowers they tend to prefer, maybe I can see more, too. What great topics you dive into and always manage to fascinate and educate me. Ouizi’s work sure is in the realm of Georgia O’Keeffe and such a little thing to create such big works of art. When I saw that she’d relocated to Detroit, and then looked at how many of her murals are scattered around your state, I wondered if you’d seen one. Apparently there are groups that provide tours of her work in Detroit; she’s not only done grafitti-like work on the outside of buildings, but also decorates bistros, shops, and so on. I had to laugh when I visited her blog and opened up her About page. It says: “Ouizi is an artist based in Detroit, MI.” Then, it provides an Instagram link, and an email contact address. She’s letting her work speak for her, and very effectively. One of your best, Linda–and that’s saying a lot. Such an interesting post, with so much diversity of information. I’m impressed with your photo as I’ve never gotten more than a blur. Brava! It just occurred to me that, for once, I’ve managed to coordinate with Wildlife Wednesday! I had resisted posting the moth photo for some reason, and when I came across the mural at Crystal Bridges, I was glad I had. It was fun to put this one together, and I certainly learned a lot. I was impressed by how well the scientists were able to communicate their research and insights. I love the way that the artist is informed by being an artisan. These are blurry lines, and I like the way she invites us to consider our own definition of art. Mine is evolving, I think, if only at the pace of a turtle! Be that as it may, your turtle was quite an artistic creation, and there are times when the turtle’s pace is just right — especially when you consider the load it might be carrying. Clearly, the line between so-called fine art and the life of an artisan blurs for her, and I don’t think that’s a bad thing. There’s something satisfying about the life of an artisan, with its emphasis on manual skills, whether the end product is bread, or bricks, or beer. I wonder if she distinguishes in her own mind between murals which end up being ‘artistic,’ and those she considers to be more craft-like. It would be interesting to know. I think I will remain content to admire the beauty and grace of those little creatures without attempting to get involved with all of the calculations concerning how they stabilize. Wow! Isn’t it amazing to consider everything that had to be thought through and developed before the flight stability experiments could take place? Computer programs had to be written, equipment designed, the needs of the moths taken into account, and so on. I thought one of the most interesting points — one which became obvious once I thought about it — was that insects always are suffering insults out in the big, wide, world. All we need do is look at a butterfly’s wings to see evidence of that! Eleanor Lutz created another gem that I think you’ll like. She built beautiful paper models of five species of plants that are designed to withstand (or which need) fire, set them on fire, turned them into .gif files, and then posted them with explanations. Your fireweed is one of the plants she chose; I suspect you’ll recognize all of the others. You can find them here. Thanks for the link! What an interesting study that is! The white-lined sphinx is unusual, my opinion anyway. I have only seen one on a flower in my yard. I can’t remember which flower but I vaguely remember it was a tropical salvia with red blooms. It is also liked by bees. hummers and, butterflies. You provided lots of good information about the moths and also the artists. Thank you for a good read. Oh yes. the photos you took are quite good. It makes sense that the sphinx moth would go to salvia, since it can deal with tubular flowers so well. I didn’t remember reading how long its proboscis is, so I looked it up, and found that it’s 8″ – 14″. How it can keep all that curled up in such a tiny body is amazing. Apparently other species have a proboscis that’s even longer. I certainly know more about them now than I did — with luck, we’ll both see more in the future. Linda, that is interesting to learn the length of the proboscis and my goodness that little moth has a long sipping staw. I wish I could see more of them. Hopefully they are around and I just do not see them. I am not outside as much for the past few years. Hopefully I will be have more energy again since I have omitted several foods that I had no idea that I should not be eating. I not only haven’t been to the Crystal Bridge, I’d never heard of it until you mentioned it. I keep learning about interesting places in OKC. One of these days, I’m going to have to visit. When I was traveling between Houston and Iowa or Kansas City, I made a very early decision to avoid Dallas/Ft.Worth, so I always traveled a more easterly route and missed OKC. Maybe on a future trip I’ll sneak in from the east. Thanks for telling me about it — it looks beautiful in the articles I read. That’s a terrific shot, and not easy. And educational too, I was ignorant of the sphinx moth. Well, I’m happy to have made the introduction. I confess the more I look at the photo, the more it grows on me — especially that little split at the trailing edge of one wing where it ran into trouble of some sort. Thanks for stopping by, and for the nice words. seeing those beautiful images of moths I have lost interest. Let them eat to their hearts content! It is truly remarkable that birds and insects can hover about and sip nectar from flowers through their narrow straw. Can you imagine how powerful the muscles must be that drive their wings at such enormous speeds. Try and do that with your arms and observe in a mirror. I did, and it became a very painful exercise. Our flight will have to be in our imagination of which the above article is a great incentive. I often fly in my dreams and no one can follow me. You’ve just added to my education, Gerard. It turns out that the clothes moth doesn’t eat those woolen sweaters. It’s the larva that does the damage, so any moth that’s flitting around isn’t a suspect and can be allowed its freedom. We’ve always used a cedar chest to protect especially favored pieces, woolen or otherwise. I haven’t checked those in some time, and I need to do that. I might be able to whomp up 30 wingbeats per minute, but thirty per second isn’t going to happen. Insect flight of all kinds is amazing (the bumblebee comes to mind) but these hovering moths are astounding. If we can’t flap and fly like they do, at least we can have the pleasure of watching their antics. What an informative post, but I do love your photo at the start. Jones is a very talented artist – easy to see why her work is highly sought-after. Her art is cheerful, isn’t it? The city of Detroit has had its problems over the years, and I can only imagine that its residents find her work refreshing. She seems to be truly fond of the place — she has a house there now, and claims it as home. If I ever get to Michigan, I suspect I might try to make a detour to see some of it. I like the photo, too. I’m glad that I managed it, because if it hadn’t been lurking about in my files, I might have paid no attention to Ouizi’s mural, or explored the science of hawk-moth hovering. Oh outstanding in all aspects Linda! Bravo! I’m glad you enjoyed the post, eremophila. Now, you have me curious about your own peculiar creature. Given where you’ve been traveling, I can’t even imagine what it might be — even your standard-issue animals and birds are pretty darned unusual. I’ll look forward to the revelation. I so envy people that talented!! It’s hard not to, isn’t it? On the other hand, you have at least one talent that I know about: a talent for bringing history alive, and making it interesting to others. A talent for history’s as important today as it’s ever been, and little bouquets of historical facts can be as much a gift as Ouizi’s bouquets of flowers! That has got to be the most wonderful thing anyone has ever said about ME!! Thank you, Linda (I don’t know what to say)! “Thank you” did just fine — and now I’ll say “you’re welcome”! A lovely post, Linda. It epitomizes why art and science need each other to achieve their fullest expressions. In Fiji, as a child, I remember being fascinated by the night visits of the hawk moths. Sometimes I would collect a caterpillar and wait and watch until it transformed into a hawk moth. http://hawkmoths.blogspot.com/2013/07/on-hawk-moths-and-other-lepidopterans.html The hawk moths I remember were darker than the ones shown in the link. With no hummingbirds in my frame of reference, I didn’t ever make a connection between hawk moth and hummingbird, but I did make a link between hawk moth and hawk moth plane. One final point, utterly unrelated to hawk moths. I noticed the archaic meaning of epitomize is to give a summary of (a written work). Lately, I have noticed American journalists, particularly on TV, using the verb ‘parse’ in much the same way; meaning ( I think) to give a summary, or a synopsis. This use of the verb ‘parse’ is as unfamiliar to me as hummingbirds. That’s odd, about ‘parse.’ I learned the word first through the expression ‘to parse a sentence,’ or to break it down into its constituent parts. Later, to ‘parse’ someone’s meaning implied breaking an argument or thought into parts. It doesn’t make sense to me that it would be used to mean a summary or synopsis. Of course, there’s plenty of misused, vague, or ambiguous language hovering around these days — and there’s always the possibility the meaning’s changed and I’m just behind the linguistic curve. There are some lovely species in your linked page. As it happens, the length of the proboscis in the white-lined sphinx moth is 8″-14″ — they all seem to be about the same length. Darwin’s assumption about the relationship between the moth and the Madagascar flowers is interesting — and he ended up being right. I didn’t know there was a Hawk Moth plane. I know the Gipsy Moth because Sir Francis Chichester named his round-the-world sailing vessel Gipsy Moth. I thought if there were two, there might be more, and so it was. I can’t believe there was a Puss Moth on the list. The caterpillar of that one is the dreaded asp, which is mostly a cute, furry collection of tiny hypodermic needles whose poison can send a person to the hospital. I accidentally brushed against one a few years ago, and never have experienced pain like that. If they didn’t use the Puss Moth plane as a fighter, they should have. Ah, thank you for finding that extensive list of Moth Planes. I had forgotten the Gipsy Moth and the Tiger Moth. The others I didn’t know. And I am glad I haven’t ever met the Puss Moth caterpillar. The secondary meaning you gave for ‘parse’ is possibly what the journalists are using. It would make more sense than my interpretation of synopsis. Either way, it is not a term I have heard before on TV. Now and then, a word will suddenly come into fashion, so to speak, and show up everywhere. It can be fun to witness the phenomenon, especially if a misused or unusual word calls attention to it. Interesting, especially how you tied science into that beautiful art work. The first time I noticed one of these creatures flitting around our backyard flower garden, I too thought I’d seen a hummingbird. But as I got closer to it, I realized it was really a moth. I think I caught a photo of it. I’ll have to go back to my photo cache on my computer and see if I can find it again. If you do happen to find your photo, I hope you share it with us. It’s always fun to see such unusual little creatures, even if they aren’t precisely rare. I have found that once I’ve seen something like a hummingbird moth, I tend to begin seeing them more frequently. I suspect it’s just that we more easily notice things that we’re familiar with. I agree. Once we are aware of a particular aspect, we notice it more and isn’t that a good thing? I will search for that photo to see if I still have it. I liked the work of the artist as she gets dirty and tired. As you probably guessed, I especially liked the high speed study of the moths. Don’t ask me to try catching a big bag of flour while riding a unicycle. I’ve seen those moths a few times. They are huge and quite skilled fliers. The thing I’m watching daily now is the Ruby-Throated Hummingbird at my feeder. My calendar records for many of the past years mark when I had the last sighting of the year. This bird is tied for the latest date and might be here tomorrow. Trouble is, today it will reach the 80’s and tomorrow will dawn in the 40’s. That will likely send it on south to you. Even our hummingbirds are moving on at this point. People who’ve had big flocks of them around their feeders are seeing only a few birds now, while folks in the Corpus Christi area are seeing many more. They’re clearly staging for their flight across the Gulf. We had light north winds today, and there suddenly are monarch butterflies everywhere. I was stopped in traffic on a local bridge this afternoon, and watched at least a dozen flutter by. It was great to see. It would be fun to see the monarchs in large numbers. We do our best to help them at they pass through our region. It hadn’t occurred to me until about ten minutes ago to wonder if the hummingbird moth would come to a hummingbird feeder. The answer’s yes. Great post and I especially liked the video. I am working on my own post with the moth in it and I’m hoping to have it up this week. Mine will not contain the info that you have. I’m not surprised you have hawk-moths around your place, given your beautiful garden. Have you ever seen them at your angel trumpets? Given their love of flowers with nice, long tubes, I suspect the moths would be attracted to them — not to mention that the angel trumpet blooms at night, when the moths are out and about. I’ll look forward to the post. I have not seen them on the Angel Trumpet, but I’m sure they do. The moth seems to stop at every single bloom. Your photo is terrific, lovely, and just enough blur in the wings to show movement, but still see the patterns. And the whole article is a success, an interesting and fun read. The videos of the moth feeding remind me of those jet tankers the Air Force uses, for mid-flight refueling. I saw some of these moths, buzzing around gardens near Chautauqua Lake, and wanted to watch them all day, pretty cool. Mid-air refueling’s fully as fascinating as watching these little moths — and probably an equally touchy procedure. It’s interesting that you’ve seen the hawk-moths at Chautauqua Lake. I did some reading recently about the renovation of the amphitheater there. Given the history, and the deep attachment of so many people to the place, the ambivalence about which direction to go with the changes was understandable, but it seems like they have a fine new facility. I love your grant proposal scenario, almost as much as I loved the homemade aspects of the actual moth cannon. That’s really an adaptation of old technology, of course. I well remember the prototypes that were around in the early 1950s, involving long straws and a small stash of peas. Of course, pea shooters weren’t the perfect weapon, because once they were fired, you still had to conceal the straw before the teacher spotted it. Now, a spit-wad… there was a weapon. Once flicked, there was no evidence — provided you could wipe the smirk off your face. Haha! I’m sure you’re not talking from personal experience, and never did such a thing. I was always impressed with the kids who could throw ballpoint pens up two stories, so they stuck in the gym ceiling. Also it struck me as a real dumb waste of time, but still, impressive somehow. Chautauqua’s a pretty neat place, although my great-uncle was taken there as a kid, and wasn’t crazy about spending a vacation week listening to lectures, sermons, and classical music. He describes that week as a month of wet Sundays. Beautiful artwork. I’ve only seen this wonderful moth a few times, that I recall. They’ve probably seen me more often. There’s no question that nature’s creatures are as aware of us as we are of them — and probably more so, as you suggest. I’ve been trying to photograph an unusual, tiny insect on a plant on my balcony. It can’t be a half-inch long, and it’s cute as the proverbial bug, but very time I try to focus on it, it ducks to the underside of a leaf or the other side of the stem. It’s like a game of hide and seek. It didn’t fit in this post, but Ouizi’s been influenced by her Chinese heritage and her family’s skill in calligraphy and watercolor. She does small works as well, and they’re exquisite. Lovely and fascinating, as always. Thank you! You’re welcome! I just did a brief scan through her instagram to see if she might have installed a mural in your area, but there aren’t any listed. I’d love to see what she might do with the PNW landscape. I imagine doing a quilt of my area, a map looking down from above….in my spare time, ha. I truly enjoyed that last video – it was fascinating! We see a lot of sphinx moths, especially on the tall phlox here on our place, but also I see many in my front flower bed in front of the house – where I have many hummingbird-friendly plants. I have not managed to photograph them, except for some blurred images, which can be lovely too, just as yours is! The creativity of scientists seems boundless. When it’s combined with the technologies we have today, the results can be phenomenal. I mentioned in another comment that, now that I know which plants the moths find most appealing, they ought to be easier to find. On the other hand, it just now occurred to me to wonder: do hummingbird moths come to hummingbird feeders? The answer’s yes — look at this! Ha ha! That hummingbird seemed put off by the moth! It looked as if it wasn’t quite sure what to think! One year we had a low-hanging hummingbird feeder off the back porch and noticed a lot of mornings the whole feeder was drained, laying on the ground. Finally, early one morning I found Daisy deer standing slightly on her hind legs, licking the feeder so that when tipped she could get the sweet nectar. Even after she knocked the feeder off of the hangar she continued to lick around the spouts to get every bit of sweetness! I think all sorts of critters like the sweet concoction! That video is so cool!!!! I have hummingbirds that I feed but I have never seen a moth! Thank you! Keep an eye out. I just found out that the hummingbird moth will come to a hummingbird feeder. You might have the moths there, too! I’m in Ohio do they come this far north? Yes! Here’s an article to get you started. Thank you that was fascinating! I love Ouizi’s statement about art, “I have an excuse to be dirty, disheveled, and decorated all the time.’ Having worked in fields where I had to “gussy-up” as well as where I had to dress down, I can attest that there’s something wonderful about getting disheveled, ha! Your moth is much more fascinating than the wormy thing I found on my tomato plant — and way cuter, too! Thanks for doing the research so I won’t have to. Not sure, but I think I found one (sadly deceased) in our backyard this morning. Isn’t that a wonderful perspective? As someone who comes home dirty and disheveled at the end of nearly every day, I certainly enjoyed reading that. I suspect she wears her paint splotches with as much pride as I wear my varnish streaks. Most of us varnishers approach our work wardrobe in the same way: buy $2 tee shirts from the resale shops, and throw them into the rag bag once they start to look too unkempt. As for the caterpillars, just remember — no caterpillars, no butterflies or moths.It’s hard to be sympathetic when they’re munching their way through the tomatoes, but it’s all part of the great cycle of life. Since they feed on tobacco plants, too, maybe you could grow a few of those and just move them from the tomatoes to the tobacco when you find them! Is this science or moth harassment? Loved your photo, Liked both the art and the craft… but I was dismayed by the science and technology. I’m curious about what it is that dismays you about the science. If it’s the well-being of the moths, I can assure you that no moths were harmed in the making of the video — or in any of this series of experiments, for that matter. It is true that insights gained from the stability studies may well be applied in fields I’m not so fond of — the use of drones, for example — but if we’re going to have drones, stable beats unstable any day of the week. Hawk-moths are such interesting creatures that they’ve been the subject of multitudes of experiments. For one thing, we know now that they aren’t capable of controlled flight until a preliminary whirring of their wings increases their temperature to a certain point. And when they’re foraging at night, they’re able to slow down their visual system to collect more light, just as we do when we use a slower shutter speed on a camera. As for art and science, they’ve always worked hand in hand. One of the first examples that comes to mind is that of Audubon, whose wonderful drawings depend in no small part on his dissection of representative birds and animals. He was able to make them alive to the eye precisely because he knew them so intimately. Today, technology’s giving us new and quite wonderful ways to help the world around us come alive. My comment was made in a light hearted mood, and perhaps it was too obscure or out of place. Let me explain that my academic education began with science and my first professional occupation was as an engineer. I value science and technology. However, the progress of technology has become so complex that it is now more common to study nature’s phenomena in teams, and sometimes multiple teams than it is to find a single person finding a new aspect of nature or inventing a new tool. As a result, there has been an objectification of nature around us. Just as some men have been accused of objectifying women, and seeing in them only a sexual toy, I believe that there are scientists who are so focused on a specific physical aspect that they lose their awareness of the whole. I do not see drones or terrible weapons as a moral stain on scientific learning. It’s man’s nature to eat animals and to kill one another. Of course, I pray for an enlightened time, but I accept the world as it is. But at times I’m dismayed by the limitations we students accept by becoming so adherent to our discipline that we lose our innocent wonder of the world around us. I agree that photographing the moths did not pain them, but if I was sipping nectar I’m sure I would mind having tiny copper cannonballs shot at me. Your comment certainly wasn’t out of place — but it’s much more understandable now with a little context. It brought two things to mind. One is the old joke I learned in graduate school about dissertations: how they become so increasingly focused that candidates learn more and more about less and less until, eventually, they know everything about nothing at all. As for “becoming so adherent to our discipline that we lose our innocent wonder of the world around us,” I’ve seen that one in action. Scientific discipline certainly can support wonder as well as providing explanations. But when method supplants wonder, the loss is enormous. While I was learning more about the hawk-moth, I came across this terrific article about Darwin, an orchid, and the moth — including a photo of one of those unrolled tongues, which gives a real sense of how improbable it is. It’s a great example of co-evolution, and a good reminder that answers don’t always show up right away. It took more than a century for Darwin’s theory about the pollination of the orchid to be proven right. Wouldn’t you love to see her work on the walls of your rescue? They wouldn’t be too bad in your garden, for that matter. 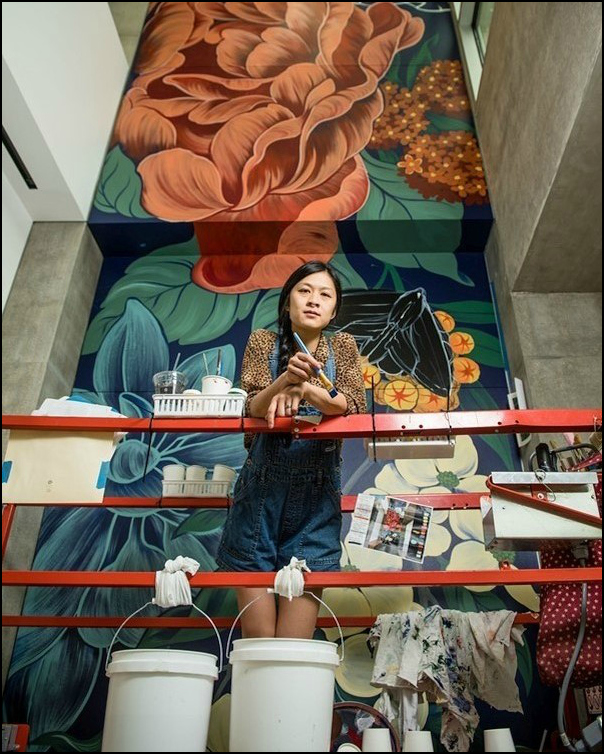 Some of her smaller works that draw on designs from her Chinese heritage are more classically beautiful: especially the peonies. It tickles me that she has so much work in places like Singapore. I’ll bet those works are special to her. Love both the real moth photo and the artistic moth, perhaps the latter even more than the former just because it’s so big and bright, and I know it won’t land on me with its dusty wings! (Shiver) I’ll have to check out Jones’s work; I really like the scale and the way she talks about it as physical work. Very cool. “It’s a poor craftsman that blames his tools” means that part of being an expert craftsman is having the experience and skills to select excellent tools. Blaming your tools means either that you lack skill, or that you chose your tools poorly because you lack the experience and skills to choose correctly. Good tools won’t bring you to your optimum peak performance on your own, but bad tools will guarantee you’ll never get there. Bad tools typically take longer to work with, and typically teach bad habits to get around their deficiencies. There’s art waiting in every natural thing. The trick for an artist is to render it. Thanks. True enough — and the first step toward rendering is seeing. We might have more artists among us if we had more people willing to take the time to stop and see what’s around them. Like you, I have been intrigued by hummingbirds for a long time. They are fascinating creatures. And the artwork is lovely. I wondered if there’s such artwork in Cuba, and I see there is. Even though much street art there is political in nature, I did find some lovely florals, too. I found that there are two species of hummingbird in Cuba, and the smallest bird in the world lives there (and only there!) — the bee hummingbird. Wouldn’t that be something to see! We’ve seen Humming Bird moths in a town in central France (Chaumont) on our way through to Switzerland and also in Saas Fee in Switzerland. The mural by Ouizi is beautiful. For me it doesn’t matter if the plants are real or imagined – it is the design that matters, and her work reminds me a little of the celebrated British designer William Morris. I can see the Morris resemblance: not so much in repeated patterns as in the fanciful designs themselves. It’s very interesting to compare her murals with her smaller scale works that are meant for hanging. There, the influence of her Chinese heritage and family is very much in evidence; she began as a child with calligraphy and traditional watercolors. Your sightings of the moths is another reminder of just how widely-spread so many of these creatures are. The first time I saw one of these, I was astounded – I bet you were, too. It’s nice seeing it through the two lenses of art and science, and your photo complements the painting well. Love the interview, too – “an excuse to be dirty, disheveled, and decorated all the time” – sounds good to me! Her comment seems to appeal to a lot of us. “Living A 3-D Life” would make a great, amusing motto for those of us who don’t mind a little involvement with the natural world and manual labor. The moths themselves are so delightful I’m eager to begin looking for them again next spring. The cicada killers already have disappeared, and I’m sure the hawk-moths are beginning to move into the next stage of their life cycle. I was interested to read that leaf litter is one of their preferred places to pupate and rest. Who knows how many we’ve stirred up with fall leaf-shuffling on our walks? We have a big moth fascinated by the lighted door bell very late each night – at first we thought it was a ghost – there was a whoosh- then we spotted the pale moth shape fluttering across. It was laughable and spooky at the same time! And here you are: another one who loves that comment about being dirty, dishelveled, and decorated. I just mentioned to Lynn that we could form a group dedicated to living the 3-D life — or we could adopt the name. I think the group’s already been formed, albeit informally. I understand that urge to paint again. I never was at all skilled, but every time I see murals like Ouizi’s, I’m back in kindergarten and first grade, wearing my apron and having a whee of a time at my easel with finger paints. I guess that might have been a 3-D kind of experience, too. I noticed that repetition- some sort of psychic or genetic link? I have three dead hawk moths on the shelf above my sink. last summer when the yellow butterfly ginger was blooming it was very attractive to hawk moths. I would go out and find them in the mornings. for some reason their long tongues would get stuck in the ginger blooms and they would die there stuck in the flower. I did manage to find one that was still struggling and I pulled it loose and it flew away. another day another was weakly struggling and I pulled it loose but it never seemed to recover and died. I have no idea why this occurred. so far this year only one stalk of the yellow ginger has bloomed and the others don’t look like they will. don’t know why that is either. That’s a wonderful mural by Ouizi. I imagine I would like all her art being a big fan of flowers myself. and I too love her comment, the 3 Ds. I’ve looked and looked and can’t find any information on a phenomenon I know I’ve heard of: bees and other insects getting trapped in certain plants when trying to reach nectar or pollen. Apparently there’s something in the structure of the plant that’s designed to cover the insect with pollen, but things can go wrong, and the insect can’t get away. I heard about it at one of our native plant society meetings, so I ought to be able to track it down again. I wonder if the ginger bloom is somehow the same. Anyway, it sounds like we have some of the same collecting habits. I have the most wonderfully perfect cicada shell on my kitchen counter right now. I need to take a photo of it — the slit on the back where the insect emerged is perfect and obvious. The mural at Crystal Bridges really was impressive. I’d love to see a show of her smaller works in person. They look wonderful online, and many are quite different. This is a wonderful post as usual Linda. I had never heard of either a hummingbird or hawk moth. I don’t know if we have any around here. The photo is amazing and I can imagine how difficult it was to capture in low light. I loved the painting and reading about the painter. So nice that you saw her at Crystal Bridges. I love the idea of her pizza pan palette. I thought of you when I saw that pizza pan palette — that’s one reason I mentioned it specifically, to draw your attention to it. I found the most wonderful page about your California hawk-moths on iNaturalist. There are more species than I imagined. You can find it here. What’s especially nice is that all of the photos can be clicked once to enlarge, and then you can select the “large’ option and get even more detail. There’s a green one in the second row that looks like it’s made of velvet. They are such great creatures, with a bit of Dr. Seuss to them. Your photo and that video at the end are both wonderful. Linda, beautiful post. I also appreciate your introduction of the artist Louise Chen Jones, because I really like her work. Did you find the moth in the daylight? I read that one of the ways to attract them is to make sure you have the nectar foods they like available. I also found out that they’ve been sighted in Florida too. Did you find yours in a regular urban garden, or in a wildlife refuge? I’m not surprised you like Jones’s work. Words like ‘lush’ and ‘exuberant’ come to mind when I see it, and of course those words can be applied to much of the natural world’s beauty, too. It was about mid-morning when I saw the moth. I finally read that this species of hawk-moth flies in day as well as night, so it wasn’t an anomaly in that sense. I’ve also learned since posting that they will come to hummingbird feeders as well as to flowers. There are some delightful videos on YouTube that show irritated hummingbirds trying to cope with visiting hummingbird moths. This was my first time to find wild columbines, and they weren’t in a garden or a refuge. They were along a creek in the Texas hill country, nicely shaded and tucked among some limestone rocks and some very nice trees, If I hadn’t stopped to look at the flowers, I never would have seen the moth. Your photo is absolutely stunning! I was delighted to read the rest, too, about the mural artist and the scientists take on the hummingbird moth. Knowing there is a young lady running around decorating buildings the way she does is such a joyful discovery. Her work is cheerful, indeed. I was somehow surprised that she decided to put down roots in Detroit,but glad, too. That’s a city that could use a little beauty and cheerfulness, and she’s doing a fine job of providing it. In a sense, she’s just offered a new interpretation of the now-trite saying of ‘bloom where you are planted.’ Maybe her blooms will help some others bloom. I hope so. She’s joining the tradition of artists coming to blighted areas (because it is all they can afford) and making them wonderful. Good for a city and good for the artists. Everything about this fascinating and colorful post enchanted me this morning. From your own dynamite photo to the artist’s murals and practice to the You Tube visual of that moth dirigible…What a beautiful creature about which I knew nothing. Thank you. It seems the hummingbird moths live in far more places than I realized. They certain live across the U.S., and California has several species. Some of them — the aptly named ‘clearwings’ — have transparent panels in their wings. I’d love to see one of those some day. Now that I know they’re around, it’s more likely, since the more we see, the more we see. Sorry to have been so out of touch, and what a treat to re-emerge and see this marvelous post. First thing: I think your photograph is wonderful, beautifully composed, and how you did that, given the subject matter, is mind-boggling. I love Ouizi’s art, and also her attitude: “I have an excuse to be dirty, disheveled, and decorated all the time.” Now that’s an appealing trifecta, to be sure. Speaking of being out of touch, I traveled only four hours from home last weekend, and ended up here in the east Texas piney woods — where an internet connection is iffy at best. I’m sure it’s due to the.place I chose to stay: not only in the woods, but down a dirt road into a valley. No matter — it’s a beautiful spot. I just haven’t been able to keep up with things as I like, and still haven’t read your post. Home today, so that will take care of that. I have no idea how I managed that photo, either. Thank goodness for digital cameras that allow a 1:100 ratio of good to bad photos. I’m just glad the little moth hung around long enough for me to recognize what it was, and then record the moment. As for Ouizi, her approach to making art and living life is appealing. I’ve been trying to pinpoint what it is about her that appeals to me, and I’ve decided it’s that utter lack of pretentiousness. Combined with her skill, it makes for some memorable art. Wow, hummingbird moths look huge. I can see how you at first thought that it actually was a hummingbird. They’re noisy, too. Their wings do make a distinct hum, which really is neat. I didn’t hear it at first, but once you start paying attention to them, you sometimes can hear the hum before you see the moth. They’re amazing creatures — I’m hoping for more sightings, for sure. I really enjoyed reading this and admiring the images. What a jackpot of an artist – thank you for showcasing her work! Yes, sometimes nature is a good mimic, and those moths do resemble hummingibrds.. or do hummingbirds resemble moths? Presently there’s an outbreak of insects that look a lot like mosquitoes but they don’t bite and are smaller/grayer… but they sound just like mosquitoes. They find their way into the houses, so using lights at night is a challenge – yuck how can I paint? last night I was working on a study of a tropical gnatcatcher, but finally stopped b/c so many insects were finding their way into my ‘tent.’ I’ve put sheets and blankets around and over my work area – but now with three layers in some areas, it still doesn’t work! the harmless insects are an upgrade from mosquitoes that were almost that bad a year ago! I wonder if lovely Louise has encountered similar problems! I was sure you’d enjoy seeing her work, Lisa. It was interesting to ponder the differences and similarities between your work and hers, despite the two of you being in quite different worlds. We’ve been plagued with mosquitoes since our September rains, but the good dragonflies suddenly were everywhere, too. I presume they were as happy to see the mosquitoes as we were displeased. Your tent arrangement’s creative, but isn’t it hot inside all those layers? I’m lucky in one respect: my nemesis, the love bug, gets up late and goes to bed early, so during its season I often can avoid trouble by varnishing when they’ve gone home. Maybe you could persuade your insects to work by a different schedule! These are all so fascinating. I’ve never seen any of these moths but enjoy the hummingbirds at my Bird of Paradise. Incredible how rapidly their wings move. One of the great joys of beginning to walk the world with a camera is simple discovery. With a macro lens, I can see detail that’s escaped me before, and with a telephoto lens, I can “approach” creatures like this without disturbing them unduly. As I’m (perhaps too) fond of saying, the more we see, the more we see. The world’s willing to open, if we’ll only look. We have hawk-moths in our neck of the woods. They are always fun to watch. That photograph at the top is beautiful. Thanks for the video, too. It’s fascinating. Lucky you! Do they come to the plants in your yard? I know a lot of people here put out hummingbird feeders as much for their own entertainment as for the birds’ nourishment, and I can imagine choosing plants for the same reason. I was so happy to get that photo, and when I found the video, I was fascinated. There are a lot of people doing interesting things out there in those laboratories. We feed the hummingbirds, too, and I must admit that it is as much for our entertainment as for their nourishment. They are so much fun to watch. The hawk-moths do like our flowers. I’ve had visitors who mistake them for hummingbirds. I enjoy your photography as much as your posts now. I feel like I should try harder with my camera. I’m not sure you should try harder — maybe you just should enjoy it more! I really enjoy going back and looking at my first efforts, from around 2014-2015. Practice may not make perfect, but it makes better, and it’s fun to see visual evidence of progress. I remember the first time I saw a hummingbird hawk moth was in a city centre garden – very unexpected! A lovely post with its synthesis of art and science. As I’ve often said, I’m more of a both/and kind of person than an either/or. Too many people think it has to be either art or science — not so! I really was surprised to see how widespread the hummingbird moths are. Now I have proof of their existence in another part of our lovely world. Beautiful photograph at the beginning, lovely composition with the columbines and dorsal view of the hawk moth. I’m used to seeing clearwing moths (Hemaris thisbe or Hemaris diffinis) on buddleia along with butterflies. There are so many beautiful moths, and moth caterpillars can be extraordinary. I was almost as excited to find the columbines as the moth. They may well be in gardens in our area, but I’d never seen them in the wild. I didn’t know about the clearwings until I did the research for this post. I’d love to see those, although any of the hummingbird moths are a delight. The poor moths seem to play second fiddle to the splashier butterflies, but you’re right: they are beautiful, and so are their caterpillars. I’ve seen several hawk moths around our flowers this summer. They’re more abundant than hummingbirds. I’ve spotted them at dusk, presumably beginning an evening of sipping. Remarkable creatures. I enjoyed your post, and the high-speed photography the video offered. Lucky you! It must be wonderful to have them so dependably present. They certainly aren’t hesitant to take on hummingbirds at a feeder. I wonder if both creatures’ ability to hover and maneuver so well gives them a little extra feistiness. I thought that video was remarkable. There are so many wonderful things going on in laboratories around the world — it’s easy for those of us not in the fields of research to miss them. What a wonderful and informative post. I love hummingbirds but have not heard of the moths so thank you for that. And also for the introduction to that amazing and impressive artist!! So inspiring. The hawkmoths have a world-wide distribution, especially in the tropics, so wherever you are, you have a chance of seeing them. If you’re visiting a garden with plants that appeal to hummingbirds, take a second look. Some of those birds might be moths! I was so glad that Ouisi included one of the moths in her museum mural. It was a surprise and a delight, just like the real thing. Oh, I loved reading about Ouizi’s work. There’s something magical about people who can visualize proportion and nuances on a large scale. Your photo of that moth at the columbine is magical, too. Fantastic capture, Linda. I was so pleased to find both the moth and the columbine. The moth is common enough in my area — at least for those who are gardeners — but the columbine doesn’t grow here; seeing them was quite an occasion. Like you, I’m impressed by people who can work on a large scale: muralists, fresco artists, street artists. Being able to visualize the final product is one thing; having the strength and stamina to carry it out is another. Some people really do ‘work’ at their art! Amazing & beautiful — thanks much for educating & entertaining us. Thank you so much; I’m glad you enjoyed the post. There is so much to appreciate here!! I must say, people cannon-balling moths mildly angered me. Poor plump beauties! If it’s any comfort, no moths were harmed in the course of the experiments. In fact, the researchers noted that confrontations and collisions with hummingbirds and other insects often move these moths “off course” even more significantly. It’s their ability to recover and get back to the business of feeding that’s quite remarkable. I’m eager for the new season to arrive. Now that I know more about their favorite plants, I’m hoping to find more in the future.